John Warner deserts his military unit to be with his girlfriend who's about to have his baby. Arriving to learn she has died giving birth, Don Pedro Sandoval wants nothing to do with Warner and makes him take the infant away. Sick with Cholera, the baby soon dies. With no one to turn to and nowhere to go, Warner becomes an outlaw and amasses a gang of cutthroats and deserters blasting a bloody path to get to Sandoval. The original title translates to 'Those Deprived of Hope Smell of Sweat and Dead Women'. It sums up what to expect in this tragedy saturated western film from Julio Buchs. George Hilton delivers arguably his best performance here bereft of his more familiar comical theatrics in films for other directors. Ernest Borgnine is an odd choice for Sandoval, but is suitably manic as the brutal patriarch. 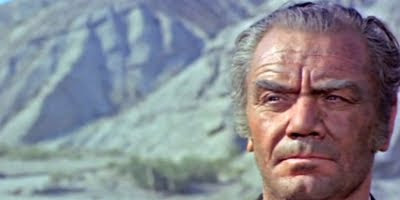 The picture also benefits from a great cast of character actors including Alberto de Mendoza, The Forgotten Pistolero, 1969 and Leo Anchoriz, Seven Guns for the MacGregors, 1966. Gianni Ferrio designed a score that matched the hopeless, destitute tone of the movie. Buchs's movie is one of the finest examples of the serious, melodramatic westerns before the cries of death were replaced by the joviality of the Trinity boys.